He is the not the healthy defenseman the Pittsburgh Penguins deserve, but he is the one that they need right now. The Pittsburgh Penguins have been ravaged by injuries this season, leading the league with the most man-games lost to injury, but they are about to get healthy at the right time. With only eight left on the schedule, it appears that defenseman Paul Martin will return either Thursday night against the Winnipeg Jets, or this upcoming weekend. It does not take a rocket scientist to know that the Pens have missed Martin badly. Martin, who has missed 41 games this season, has suffered two different injuries during the 2013-2014 season. Martin missed 23 games earlier this season with a fractured tibia, and then broke his wrist during the Winter Olympics and has been out of the lineup since then. 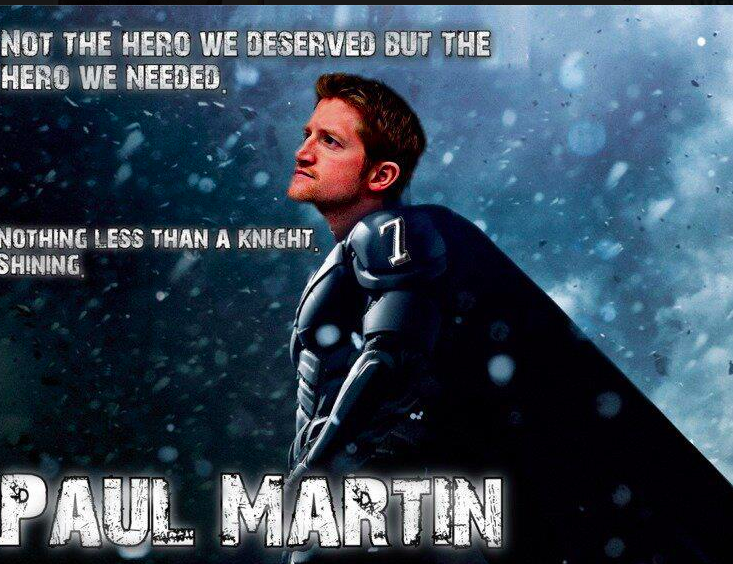 Martin accounts for $5 million of the Pens' salary cap and is usually the quarterback on the top power-play unit. A power-play unit that has been struggling mightily in recent games, going 1-20 with a man-advantage in the last six games. Not only have they been without Martin, but they have been without Kris Letang and Evgeni Malkin, as well. All three men play the point on the power-play, which has hurt the second best unit in the NHL, causing guys like Jussi Jokinen to play the point. Martin will also help out when it comes to possessing the puck. Martin's return will help the Pens when it comes to possessing the puck, getting the puck out of their own zone, and in the transition game. The Pens have been awful when it comes to possessing the puck this season, especially compared to previous teams in recent history. Martin's possession numbers aren't the best, but he's a significant improvement over everyone currently in the lineup not named Maatta or Niskanen. Martin's return will also help put Maatta in better spots, as Martin will be deployed against the opposing team's top unit. Quality of competition. Martin plays against the best. Not only will Martin's return help out with the depleted power-play, but Martin will also be able to eat up some many needed minutes. 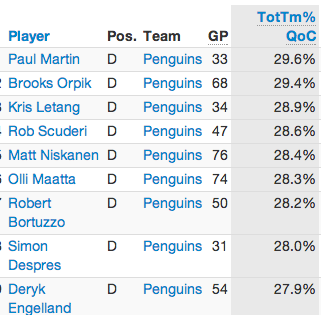 Martin leads all Pens' players in average time of ice this season, averaging over 24 minutes per-game. In case you haven't noticed, the defense, mostly thanks to the absence of Martin and Letang, has looked worn-down for the last month or so. Increased minutes for Olli Maatta, a 19-year old rookie, who also played in extra games during the Olympics, has caused for Maatta to look tired and he has definitely hit a ceiling. Hence the Pens giving him a night off. It would be nice for Matt Niskanen, Brooks Orpik, and Robert Scuderi to all get nights off, as well. It's hard to give everyone a night off when you're already missing your top two defensemen. On top of giving guys, a chance to get some rest, with only eight games to go, Martin's presence will allow for his fellow defenseman to play fewer minutes per game, which has also taken a tool. For example, Maatta was playing a little over 14 minutes-per game in October and over 17 minutes per-game in November. Between Martin and Letang being out of the lineup, and the fact that Maatta was playing so well, the Penguins obviously had to increase his ice time. In the month of March, Maatta averaged over 21 minutes-per game. As I mentioned earlier, Maatta has hit a ceiling, and will likely be a lot more efficient if he can play about two minutes less per-game. It does not take a genius to figure out that Martin returning will help the Penguins as a whole, but perhaps no other player will benefit more than Orpik. As many have already pointed out, Orpik looks like he is on his last legs. No other Pens' player was on the ice for more goals against the past two months that Orpik. On top of that, Orpik's possession numbers have tumbled without his defensive partner, Martin. The return of Martin means that he and Orpik can be reunited as a defensive pairing, which will allow Niskanen and Maatta to be paired up full-time. Recently Orpik has been paired up with Deryk Engelland, Scuderi, Simon Despres, and Niskanen. Let's just say that Orpik is better when paired with Martin. In the end, Martin's return doesn't mean that I think the Pens are now favorites to win the Stanley Cup, but his presence will help the team in almost every aspect. With only eight games to go, it's great that Martin is able to get some playing time in before the postseason starts. Between the kind of minutes he plays, his offensive production and ability, and the current state of the defense and power-play, Martin's return couldn't come at a better time. Sports Injury has been successfully treating it’s clients since 2005, assisting in everything from injury recovery for athletes to providing relaxing massages to those that simply wish to indulge themselves. Great news on Paul Martins return!!! One by one we're getting our team back!!! Great news. Now he can cover up for Orpik... the poor guy.